Tribeca After School Session- Register Now! Students will be added to our pickup list for the following week from your registration date. You must be able to drop off for your first session. Have questions about our after school programs? Check out our FAQs below. We are now offering homework help until 6:30 for an additional $5/session. You must sign up for the entire semester. You can add this option when you register by clicking the button above. If your child attends a local school, we are happy to do free school pickup, as long as there are at least 4 kids enrolled in the session from that school. You can check our potential pickup list here. As with our weekend classes and summer sessions, we will be teaching the kids the fundamentals of engineering through hands-on learning. Our K-2 classes are a bit more craft and design focused for our smallest builders. We will teach fundamental engineering concepts but with an emphasis on creativity and imagination. Each week we build a new robot and learn a new engineering concept. We will integrate hands-on building experience with demonstrations of engineered objects in the world that use the same concepts. Most weeks students will take home a robot or machine that they build. 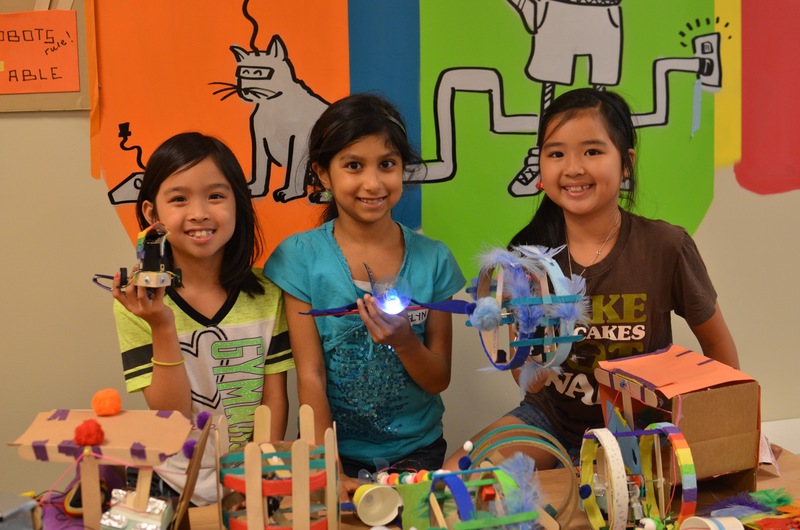 This is a really fun class for children because it combines hands-on building and art, with real electronics (servos, LEDs, motors, sensors) and programming. 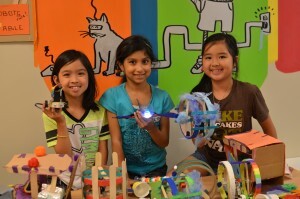 The kids will work in small groups and create robots that interact with the other robots and environment. No programming experience required! We will be using the fantastic Hummingbird robotics kit to teach programming. This versatile platform was designed at Carnegie Melon’s CREATE lab. This is one of our favorite classes to teach because children have THE BEST ideas — and we get to help make the ideas become reality! Each semester we will introduce some superfun, new electrical components. We haven’t finalized the list for this semester but here are some examples from past semesters. 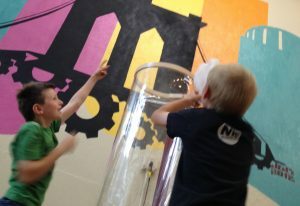 The children will create their own inventions, so we welcome children to come in with recycled materials and crazy ideas! 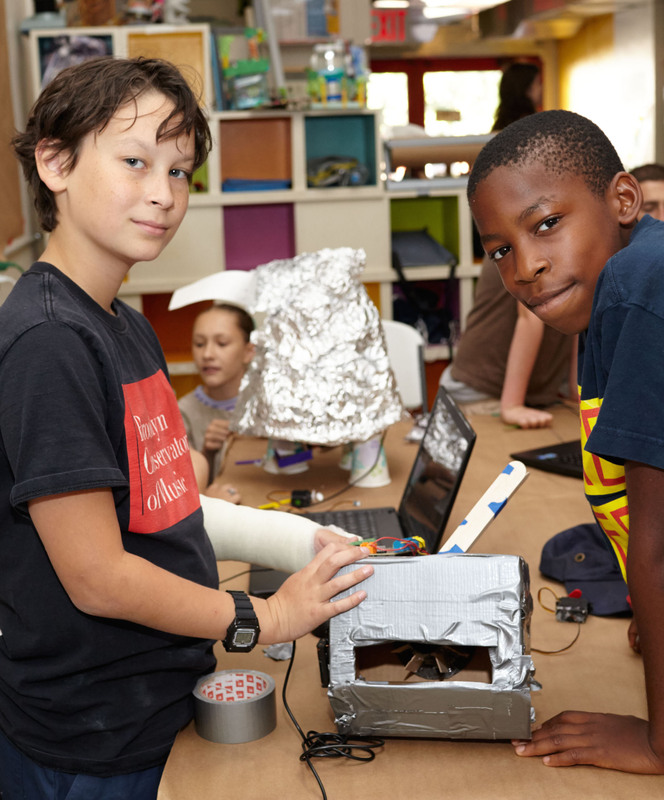 To support different work-styles, we encourage children to mentor and assist each other, experiment with the materials, and work on a multi-week projects. The children will bring home projects intermittently based on their own interest and work style. Sometimes new inventions are a success and sometimes they are not! Some kids do well with this type of class others do not. Please take into consideration your child’s unique personality before enrolling them in this class. For the most enjoyment, they have to be good at coming up with their own ideas and working without strict guidance from a teacher. Prerequisite: This class is only available for kids who are in 3rd grade or above and have taken at least one semester or two weeks of summer session with us in the past year! If they don’t meet this criteria, it means that they won’t know what they are doing and the semester will not be fun for them. We will be checking to make sure each student meets this criteria. SPRING 2019 – See table at the top of the page for confirmed school pickups. Do we offer pickup from local schools? Yes, see chart above. The class is sold out. What do I do now? Once a session is sold out, you will see a “waitlist” button. Please click on that and add your information. If spaces become available, we will let you know! Is it okay if my child has never taken a class with you before? Yes, the only exception is for Friday’s Robot Inventors session, the child must have taken at least one semester of afterschool or completed two weeks of summer session in the past year. My child is very mature for their age, may I sign them up for a session that is above their grade level? Sorry, but we are strict with ages and grade levels. The child must be enrolled in the grade that is list on that program. Are there any make-up classes? Yes. You must contact us first and we will coordinate the date to do the makeup on a day with the same curriculum. It is possible to make up the class at another location. All make-up classes must be within the same semester and as soon as possible after the originally missed class. The project that they will be doing in the make-up class may be a project that they have already done or will do. We canNOT offer school pickup on make-up days. You are only allowed three make-ups per semester. My child was in your summer session and/or one of your other after school program. Will the curriculum for this program be different? We create new projects every semester with as few repeats as possible. We will occasionally bring back some of our “best of” or beginner projects to get new kids up to speed but after that, the robots will be new. These after school programs don’t work for our schedule. Will you be offering other classes and events? Yes, please check out our weekend classes, full day sessions, and clubs! My child really wants to learn to solder. Will any of the after school programs have soldering? Yes, we sometimes offer a soldering after school session for older kids. But not for this semester. What does my child need to bring on the first day? They don’t need to bring anything unless they have an Epi Pen, inhaler or similar medication. Then please have them bring those each week. If they are in the Robot Inventing class, they can bring their ideas for cool new robots with them, or we will help them brainstorm the first week. What do I need to provide prior to the first day? We got most of what we need from you during the registration process. However, if we are picking up your child, we will send you an email about a week before the class starts with additional questions, forms and information. Will you give the children a snack? Yes. If your child has any sort of food allergies though, please send them with a snack. We also encourage sending kids with a reusable water bottle. Go Green!